The infielder started and played all nine innings against the Padres and right-hander Matt Clement. Blum stepped into the batter’s box in his first Major League at-bat and promptly went down on strikes. He figured things out at the dish as the game wore on and finished 2 for 4 at the plate with a double and two RBI, as the Expos handed San Diego an 8-0 loss in Blum’s debut. He then completed his first season, hitting .241 with eight home runs and 18 RBI in 45 games. Blum ascended the Minor League ranks after being selected in the seventh round of the 1994 First-Year Player Draft out of the University of California. Since reaching the big league level 12 years ago, Blum has pieced together a successful professional career with a .251 average to go alongside 978 hits and 204 doubles. 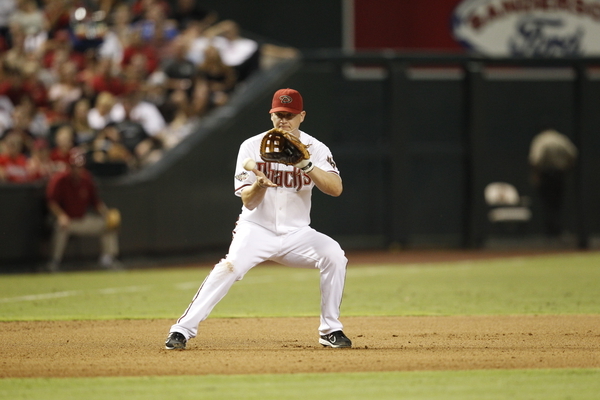 Blum has also provided versatility, as he is capable of playing every infield position. The veteran owns a .977 career fielding percentage. He helped the White Sox reach the pinnacle of professional baseball in 2005 when Chicago claimed the World Series title, thanks in part to his 14th inning, game-winning home run in Game 3 – his first Fall Classic at-bat. It’s been 13 memorable seasons for Blum, yet his debut and the 2005 World Series still remain two of his fondest baseball memories.